I own a single-storey semi-detached ground floor unit/townhouse built upon a concrete slab. Rather than completely renovating my own kitchen/bedroom which would require stripping away lots of built in cabinets/sink/internal wall etc. I thought it might be more economical to just accept that neighbour noise will enter my unit, but maybe I could isolate the majority of that noise in my own kitchen so I can still enjoy my living room area relatively noise free. Here is a copy of my floor plan, the shared wall is on the left hand side as my unit is basically a mirror image of my neighbours unit. Is this a reasonable solution? What special steps would I need to take when building a wall? Would digging out a deep groove into the floor. ceiling or sidewall before building the wall help to isolate noise from traveling to other rooms? Would I even need extra soundproofing material or would a standard wall be good enough? I've also contemplated installing in some sort of thick temporary sound barriers or maybe a thick sound curtain, but I don't think these would ever be as good or as economical as an actual wall. any help, suggestions or ideas would be much appreciated. normally I simply use a roller latch system with no hole in the door. if the room needs to be secured I opt for double door system with deadbolt on outer door. other then that you can try foam or MLV to make a cover. Thanks again Randy, I will try to add the same material to the door that I did to the wall and see ... I hope the hinges can handle it, also what about the deadbolt ? I imagine this can be a problem, how do you deal with that ? Build a little cut out to access the deadbolt ? Or remove the deadbolt and fill in the bore and use a different system for locking ? no matter which path you take, you will have to get the weight increased. 2 1/2" solid oak doors are around 175 lbs. and expensive and still might not be enough. 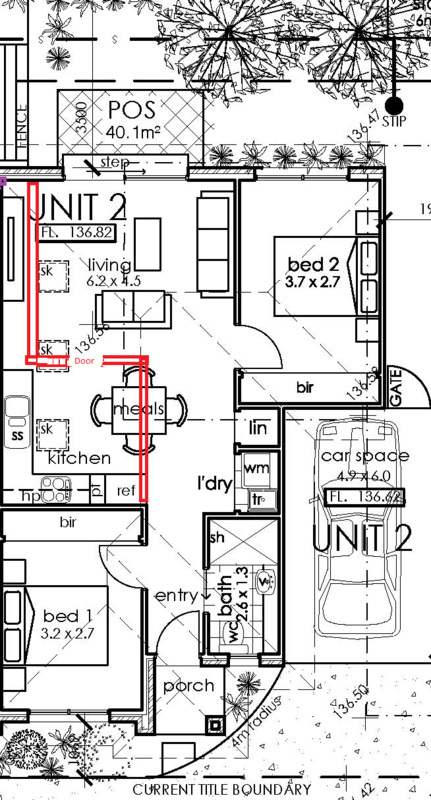 the first thing I would do is calculate my wall mass (lbs per sqft.) then see if it feasible to add the additional weight. if you can, then add the weight to your existing door. if not look into a second door with enough weight to exceed the wall weight. Thnks, I made a mistake by buying the metal doors, they are already hung, the good thing about the metal doors are they come with a well sealed jamb and threshold. 1 - build up the metal door to match the wall with MLV and 2 sheets of 5/8 drywall with green glue ? adding a second does make a huge improvement as well. Im not a fan of metal doors because of the foam or fiber fill.. I have added everything from MLV to lead sheet, even cement board..
Soundproofing your Condo, Townhouse or Bed & Breakfast / Re: Duplex: Soundproofing between floors, next steps? to decouple or roll the dice on durometer? depending on where you have the room to do one of these applications it would entail losing another 1 1/2" for best reduction or 1/2" for better reduction then you have. in order to reload that amount of mass you would need clip and channel not RC channel as it is not recommended for more then 2 layers of drywall. as for you attempt upstairs you can pull it all back up except for the cement board layer and tile and install a decoupled floating sublfoor on top ( 2" lift) and this would also prevent flanking impact around a decoupled ceiling below. I like decoupling over durometer as you have broken the amount of pathways to the original subfloor and used a puck system with a 50-60 durometer ..as apposed to covering the entire floor again only relying on durometer. Space becomes my only battle on the flooring systems. Feel free to reach out and call me direct.